Dip into any of the 200 tips in this handy book to make yourself a better yachtsman. They are the ve.. Guiding a craft using one of the oldest of the mariner&apos;s arts-celestial navigation As romantic-..
Every essential calculation you need for coastal and offshore navigation This book is an aide memoir.. Passage Planning Companion is your guide to writing a clear, easily understood passage plan, which f.. 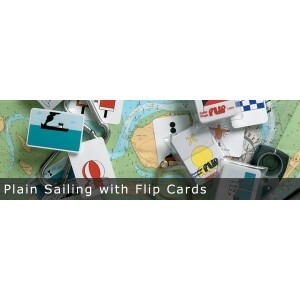 Welcome to Flip Cards - a proven Self Instruction Learning System for Mariners.Flip Cards is a syst..
A replaceable rule pad, landscape format 250 x 150mm in hard plastic covered covers with brass screw.. This beautiful full-colour book covers knots, splices and whippings. It begins with the ten knots ev..
Knots & Splices&apos; compact format, level of detail, wide coverage, and excellent illustrations ma.. Practical step-by-step guide to tying knots - essential information for all sailors and anyone wanti.. Learn to Navigate has been the bestselling introduction to navigation for almost 20 years. With its ..
A good working knowledge of the Rule of the Road is essential for both skippers and crew of yachts a..
Navigators have only two questions: œWhere am I? and œWhere do I go now?. This book shows the simple.. Written by Bill Biewenga and edited by the meteorologists at Commanders&apos; Weather, North U Weath.. Both concise and comprehensive, this out-and-out &apos;crammer&apos; covers all the essentials of th.. The complete navigation reference for beginners and experts including electronic simulators for GPS,.. Presented in bite-sized topics in a very accessible and undaunting fashion, and packed with colour i.. This handy pocket guide contains all the most useful knots you will need whether on board or at the .. The Reed&apos;s VHF DSC Handbook is a user-friendly guide that gets marine VHF radio users quickly u..
An instant reference source of facts and practical hints, in the form of a ring-bound 24-page flip-o..
A Seaman&apos;s Guide to the Rule of the Road - Based on the International Regulations For Preventin.. This is a complete beginner&apos;s guide to the sit-on-top kayak. Sit-on-top kayaking is the fastest.. The 12 Volt Bible is a complete introduction to the 12-volt electrical systems used on small boats t..
A guide for those who wants to get the most out of sailing. It is designed to teach the basics of sa.. The skipper&apos;s Pocketbook - A full-colour reminder of everything that&apos;s difficult to rememb..